When arriving in Oslo for the Prize Cermony – Al Gore took the Airport Express Train to town. He made a big fuzz about this in the media. This train ride was to be seen as a Climate Statement. Well. According to the Norwegian paper Verdens Gang his luggage did not. It was sent by car to his hotel. In a Mercedes van, to be precise. Does this strike anyone as a bit odd? After the Prize Cermony Gore went to Sweden – to meet with the Cabinet and to address the Parliament. He did not take the train. Nor did he use the Scandinavian Airline Systems frequent shuttle services. He was picked up by the Swedish Governments private jet. But Gore was still to produce Hot Air. Not only in the Swedish Parliament. From Stockholm he went to Frankfurt. Once again in the Swedish Governments private jet. None of the 17 flights with SAS and Lufthansa on the route that day suited him. So again, he emitted huge amounts of CO2 for no other purpose than his own comfort. The bill for Gores trip Oslo - Stockholm - Frankfurt was picked up by the Swedish Taxpayers: About 12-15.000 euros. Al Gore – the guy who wants the rest of us to stop flying, driving and doing all that other stuff that's emitting CO2. Just because he has a (not very good) theory on what is driving climate change. Words like »hypocrisy« and »expensive« comes to mind. So what are you trying to say? That because Al Gore is flying an airplane, there is no global warming? I look at this type of smear campaign, conducted by you and intellectual burn-outs like Sean Hannity, as the last pathetic attempt to delegitimize what Al Gore et.al are saying. Here's how I see it: You can't really accept that the scientific debate regarding global warming is over. The reason for this is that this scientific fact deals a heavy blow to your way of looking at the world. This is why you're involved in this unintellectual campaign against Al Gore. Since you are unable to attack the issue at hand (Global warming is happening) you attack one of the figure heads of this movement. And you're just waiting for Al Gore to do a "Monica Lewinsky-thing", because then people might stop talking about global warming altogether and start consuming unresponsibly again. So please for heaven's sake,focuse on the f**king ISSUES, not the individuals. Leave that to Aftonbladet Klick! or Verdens Gang. No Jakob. 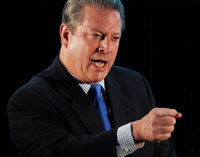 TEC simply and clearly demonstates that Al Gore - your hero - is a fraud and a liar. Al Gore obviously does not believe in his own message. Actios speak so much louder than words, don't they? Al Gore is not my hero. I agree with you that it is hypocritical to say one thing and do another. But what this smear campaign is trying to say is that "since Al Gore does this, there can be no truth to the theories about global warming, Al Gore is a jackass and all he does is lie, so the theory about global warming can't possibly be true. So don't worry, drive your Hummers, fly your private jets because nothing is happening to our earth. Consume, consume, consume!". If you buy into this, you're not very concerned with scientific facts that have been represented by other, more scientifically acclaimed sources. The only way to refute these facts is to claim divine intervention and if you do I'm not the one to talk to. But if you beleive in science there just is no counterargument. Then comes the story of SOLVING this issue, which is a totally different story. We rational individuals are focused on that instead of clinging on to a closed debate that has been lost. Doing that is not very constructive and that is what, according to me, this blogger is doing. For the record, I was also a sceptic until it became unrational to be one. Science proved the sceptics wrong. I was wrong along with all the other sceptics and I don't see the reason to deny that and moving forward. "But if you beleive in science there just is no counterargument." The correlation temperature - the suns magnetic activity is far more accurate than the one temperature - Co2. Then there is the small detail of temerature driving CO2 levels - not the other way round. John: You sound like you know more science than me. I admit that I haven't performed any studies myself on this matter. But I have been in academia long enough to know that consensus across the scientific board like this can be trusted to be pretty accurate. For example, even though Thabo Mbeki had his ideas about HIV not leading to AIDS, scientific consensus said something else. The people that I have a problem with in this debate are the "Thabo Mbekis". Like I said, we can disagree on how to solve this problem. But a problem it remains. Don't you agree? Science is not something you vote on. You put up a theory. Then you will debate it, test it and continue to build on it. Saying that the debate is "closed" or "over" is not the way to do things. The CO2-theory has got huge problems. And other theories stand up better to scientific scrutiny. If we where to have a static (majority vote) approach to science, it would not evolve at all. The Al Gore / IPCC-approach is not only filled with doubful claims. It is wily as such. now you are at least attacking the theory, which I feel is more constructive than attacking the individuals putting forth the theories. Even though I still consider myself convinced that human behaviour has put the earth at risk. Is that something you agree on or are you a denier(pardon the phrase)? "Here's how I see it: You can't really accept that the scientific debate regarding global warming is over." Please, the scientific debate is all well and is flourishing. The political debare do seem to be over, oddly enough. In light of several ground breaking discoveries disproving the IPCC/Al Gore alarmism, the political debate should to be more lively. The last ten years we've learned that heat does not accumulate in the climate system as the IPCC hypothesis require. We've learnt that there is ample evidence pointing to negative feedback as opposed to the IPCC idea of a large positive feedback. We've learnt that the signature of CO2 driven temperature increase in not present neither spacially nor temporally. And all the disgusting details of the inner workings of the IPCC have leaked. IPCC is a dead body, the alarmism is still alive but probably not for long. The number of CO2 "sceptical" scientists is increasing. How come, if there is a greenhouse effect (we are not talking climate change now, but the specific Al Gore theory) that ground temperatures increase and temperatures in the troposphere does not? actually tropospheric temperatures do increase. They just don't increase more than ground temperatures, which they must if CO2 absorption of infrared heat is the cause of the warming. "But the debate between sceptics and environmentalists, in my view, was regarding this was cyclical or caused by human activity." -I'm a sceptic and an environmentalist, if you by that means someone who go to great lengths to protect the environment. That aside, no, sceptics usually claim that climate is driven by a multitude of forces of which CO2 is one of many. Sceptics also generally believe that climate sensitivity to forcings are low (lamda is below 0,5 or so). "Then you can of course go into further detail regarding HOW humans really affect the climate." -This we should. One of the major ways we do influence climate is deforestation. And I see the CO2 simplicity being a major factor behind the increased destruction of forests and habitats. "And if you want this to be a debate about scientific honesty I think it would be fair to critically contest the views of the few remaining sceptics. Ties to oil companies?" -Please, don't use the word scientific honesty together with accusations of oil bribes. "The important question is who the different theories serve best and what purpose the theories serve?" "I have trouble seeing what ulterior motives scientists have when declaring that humans need to change their habits? Please enlighten me"
The ulterior motive of the alarmists is plain to see: they think they do good when they exaggerate, because the ends justifies the means. Much like other believers in history, be they Stalinists, Maoists, fascists or what ever. But they don't do good because they are ignorant about the how the world operates. They don't see the suffering they create in poor countries, they don't realize the long term effects of what they propose (heck, they act as if the economy was sustainable today and if we only stopped development troubles will be avoided). The ulterior motives of the sceptics are probably much more diverse. But money is not one of them. Ask Henrik Svensmark about research funding to appreciate that one. i respect most of your opinions but I also notice that you use your intellect mostly to attack the alarmist's views and that you are kinder towards the sceptics. Nothing wrong with that, i'm just telling you that it's obvious. One area where I must warn you is when you say "They don't see the suffering they create in poor countries". I wouldn't say the "alarmists" are the big satan on the issue of global poverty. Study some Development Economics, Cultural Anthropolgy, Colonial History and Non-mainstream Political Science and you will find a more beleivable answer for the question why these people are poor. and you're also saying that it's not a problem who funds the scientist? You're saying that every form of scientific research is objective? I will beleive that when you show me either a report funded by cigarette companies that says "smoking is very bad for you" or a report from oil companies that says that fossil fuels are damaging the environment. Or a study performed by Leninists that says that economy is a plus-sum game. In short, show me some facts! "...I also notice that you use your intellect mostly to attack the alarmist's views and that you are kinder towards the sceptics." You also point to other reasons why poor people are poor, and well, in general poor people are poor because they have not had development. Poverty is the natural state throughout history. However, today climate alarmists do propose measures that obviously and directly hurt the poor. Everything else alike, less trade, less FDI, slower world growth will all hurt the poor. Likewise, our use of biofuels upset markets all over the world, and short term that makes it harder to feed your family. Funding science create biases, I'm not arguing against that. It is just that most if not all sceptical scientist recieve no money at all from industry and especially oil industry. Compare this to the gravy train of IPCC and research grants from the governments who make up the IPCC. It is just not possible to argue that sceptisism is money driven whilst alarmism is idealistic. If that would be true, the sceptics would not be so poor and the alarmists would not be so rich.